Common Sense was written by Thomas Paine on January 10, 1776. The 48-page pamphlet presented an argument for freedom from British rule. Paine wrote in such a style that common people could easily understand, using Biblical quotes which Protestants understood. The document played a major part in uniting colonists before the Revolutionary War for freedom from the British. Common Sense also led to the Declaration of Independence later that year. Ironically, Thomas Paine was born in England. Dropping out of school at age 13, he developed interests in science, religion, and ethics. He tried working in his father’s corset shop, and also worked as a grocer, teacher, and tax collector. His rebellious ideas and political ideas led him to write about various human inequities. In 1774, Paine met Benjamin Franklin in London, where Franklin convinced him to move to America at a time when the colonists were on the brink of revolution. He saw independence as a great cause, declaring his opposition to the British monarchy. Common Sense presented two main points: independence from England, and the creation of a democratic republic. Because of its treasonous content, Paine wrote Common Sense anonymously. He wrote in a language colonists used every day, making a more significant impact in spelling out the inequities which colonists faced under British rule. The clearly defined reasoning in his writing led colonists to unite in the patriotic cause of freedom. Volcanoes. At a time when American colonists were on the brink of revolution, Common Sense focused on reasons for independence from Britain. Paine pointed out that there was no sense for an island to rule a continent. He reminded the colonists that America was not a British nation, but a nation composed of many different people, of varied influences. He also posed a moral question, asking, “If Britain was the true ‘mother’ country, would a mother burden her children, and treat them badly?” A more practical and less emotional topic was that the distance between the two nations prevented timely correspondence of governing petitions and issues. The charge was that Britain did not consider the best interests of the colonies that represented it. Being a part of Britain would also involve America in unnecessary wars. This would prevent the colonists from foreign trade. 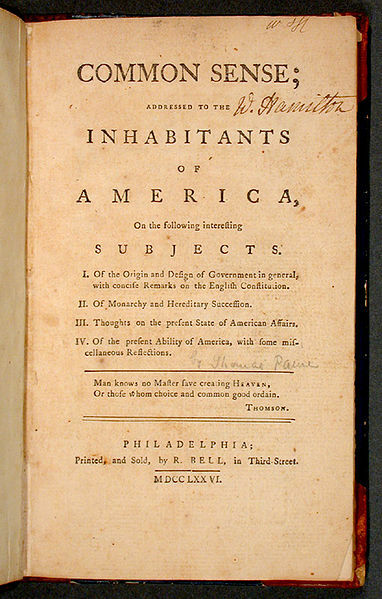 Paine pointed out that colonists were oppressed and persecuted under British rule. Did you click on the link?